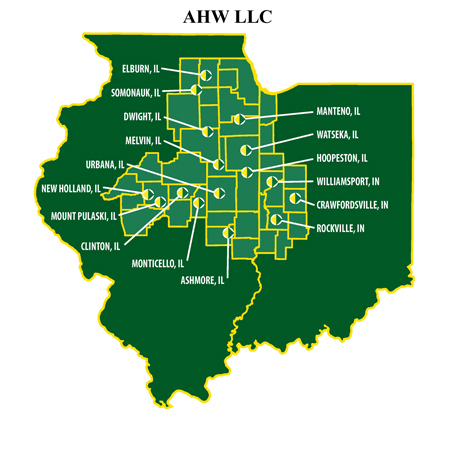 We are a wholly owned subsidiary of AHW LLC a 16 location John Deere Ag and Turf dealer group serving eastern Illinois and western Indiana since 1932. We are located in the dealership location on the south edge of Watseka a farming community in East Central Illinois. Our location encompasses all facets of our rapidly growing internet presence. This includes office space for administration of all AHW web sites, ecommerce and mcommerce . This location also provides over 34,000 square feet of warehouse space and houses the shipping and receiving departments for two of our web sites as well as corporate stocking for our 16 store locations. Our rapidly growing internet division is the largest on-line reseller of John Deere products which now includes the following web sites GreenFunStore.com and GreenPartStore.com. Our Ashmore dealership location also houses ShopGreenDealer.com. The employees listed below are our year round full time staff members. Several seasonal employees are added during the peak summer season to accommodate the enormous spike in daily orders.